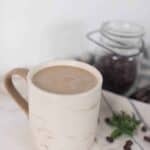 I whipped up this frothy, mildly sweet, bulletproof style, dare I say, superfood coffee. It will definitely get you going in the morning with the energizing peppermint kick, caffeine and healthy fats. Pour into mug, garnish with one of your kids' candy canes, and enjoy! Optional: Make homemade whipped cream: Add in some more cream into the blender and make some fresh whipped cream to put on top. Just make sure to not walk away and do other things while it is going, or you might end up with some butter.